Overtime, things start to slow down, break, or don’t function as efficiently as they once did. Running an optometric practice is no different. The tools and processes once believed to have been an industry-recognized best practice can’t keep up to meet the evolving demands of patient needs. Using outdated and broken processes in your optometric practice is disrupting your ability to move patients through you practice efficiently. 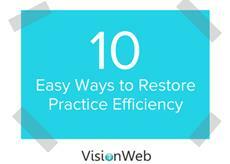 Luckily, in our new eBook, 10 Easy Ways To Restore Practice Efficiency, you can take the guess work out of achieving practice efficiency by learning how to use cutting edge technology to streamline your day-to-day operations. Download our new eBook, 10 Easy Ways To Restore Practice Efficiency, to discover how to streamline your office workflow and repair broken and outdated processes.